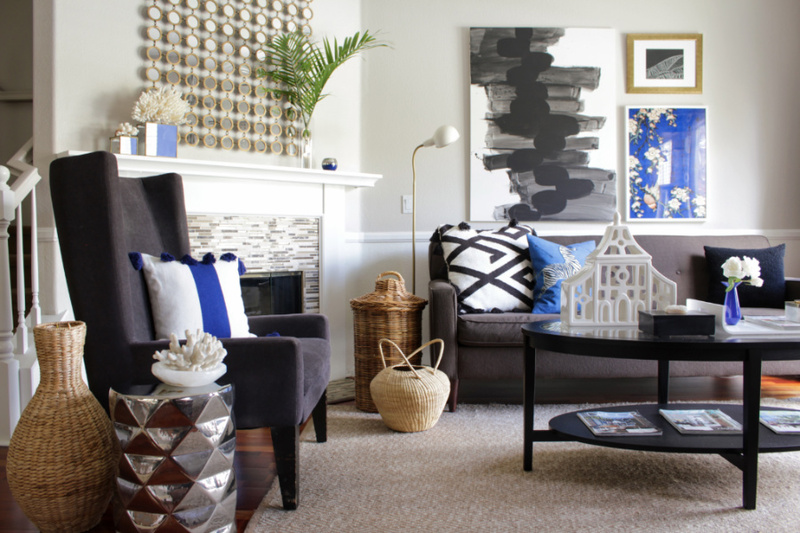 The wrong rug can ruin the look of any room so I came up with some helpful tips that will help you choose the right rug for your home. A rug is both useful and decorative. Rugs protect your floors, give you comfort under foot, muffle noise, add texture, color, style and can even define a space. 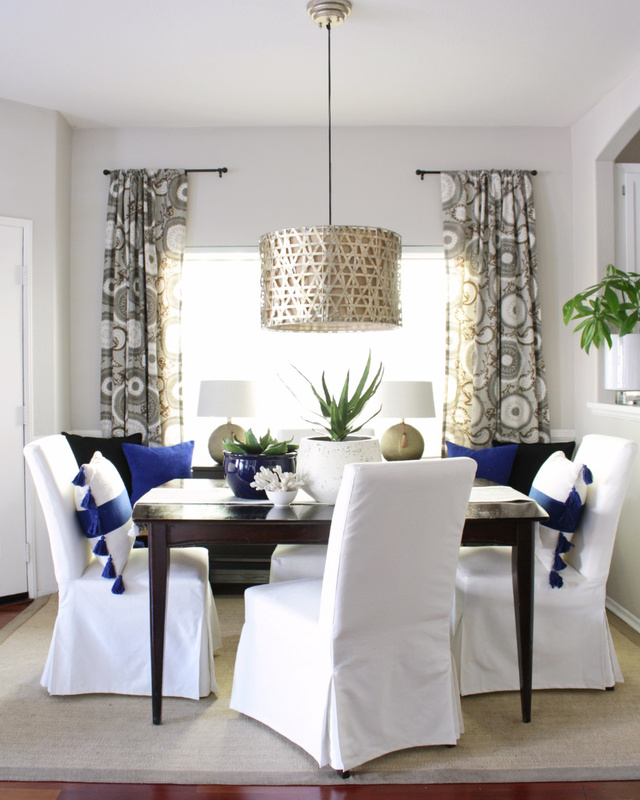 Especially when you have an open floor plan -a rug tells you "here is the living room, and here is the dining room". What SIZE would be best in the space? What STYLE and COLOR of rug should I look for? What MATERIAL should my rug be made of? How much is this rug probably going to COST me? WHERE should I start looking for rugs? Most people purchase 5x7 rugs which are almost always going to be too small for a space. Why do people buy 5x7? Probably because they are the least expensive or because they just don't know any better. 5x7 rugs usually only work for a small space like a kitchen or bathroom. For living rooms I usually go for a 7x10 or bigger and a dining room, probably no smaller than 6x9. Just remember this: in the living room, the rug has too be big enough for all of the seating to evenly touch it. When the furniture doesn't touch the rug it makes everything else in the room look weird. It makes the furniture look like it's too big for the space and it creates a weird focal point on the coffee table. In a dining room, the rug should be big enough so that when you scoot the dining room chairs out to sit on them, the chair legs are still on the rug. If the rug is too small, then you'll annoyingly get your chair stuck under the rug when you scoot it back in. Now that you have some pointers, whip out your tape measure and find out what size rug you'll need before you buy. There are synthetic rugs and there are natural fiber rugs. Synthetic rugs are cheap and readily available at your department stores like Target and Walmart. There's actually a lot stylish-looking synthetic rugs out there but they aren't my first choice. They are hard to clean and can look a bit cheesy in a space. Synthetic rugs have this weird "sheen" to them that I'm really not a fan of. Synthetic rugs are usually made of polyester or nylon fibers. Rugs that are made of natural fibers include silk, cotton, jute, sisal and wool. Wool rugs are the most popular because they are very durable, feel great under foot and look better with time. My favorite type of natural rug is a jute or sisal rug. (If you don't know what jute or sisal is, think of a basket or rope since that's kind of what it resembles but in a rug form.) I have a jute rug in my dining room that I love. They are VERY inexpensive, are easy to clean and go with any style. It's easy to get overwhelmed with rug choices because there's so many options! Not only that, we also have to think about the color of the rug and whether we want a pattern or a solid. I'll give you some pointers when it comes to choosing a style and color for a rug. Personally, I love a solid, neutral-colored rug. More than color, I like rugs for the texture they bring. I like bringing color in through art and accessories and use rugs to anchor a room and bring some softness and texture to a space. You can never go wrong with a grey, navy, or earth-toned solid rug. It will match mostly everything and is easy on the eyes. If you crave a bit more excitement, then by all means, add some color and pattern! Large-scaled stripes or diamond-shaped patterns like ones in a Moroccan rug are very easy to work with in any room as well as a more traditional pattern like those in a Persian rug. Prices range from about $200 to over $1,000 for larger sized area rugs. Cotton and jute rugs are going to be the least expensive and handmade wool and silk rugs will be more expensive. You can definitely find some good deals out there, just do your research and look at the fibers the rug is made of. If a 100% wool rug is out of your price point, then the next best thing would be a wool blend where the rug has synthetic material as well as wool which makes the rug much more affordable and can still look and feel very nice. I have purchased most of my rugs online and my favorite online rug retailer is RugsUSA. Their prices are INCREDIBLE and they have an amazing variety of rugs. I recommend filtering your search by size, color, style and materials since there are so many beautiful rugs to choose from. If you are new to rug buying, I recommend you see some rugs in person so you get a better idea of what kind of rug you want in your home. Pottery Barn, West Elm, Living Spaces, Target and IKEA are stores that most people have around their neighborhood and they have a pretty good assortment of different style rugs. Visit those stores and compare a jute rug to a wool rug to a synthetic rug so you can get an idea as to what kind of rug you want. It's all about exposing yourself to these things, right?! Love this!!! So helpful. Now can I send you multiple pics of rugs for your opinion ��. Kidding. I will keep all your tips in mind, referring back often I'm sure. Thank you, thank you, thank you! When you choose the right rug with the right curtain for your space, it will simply change the whole vibe of the space while on the other hand, if you fail to get the right rug or curtain, it can make your room look very clumsy and dull. Therefore, you need to pick the right rug and curtain so that it perfectly complements the interior of your home.